Patricia May believes in the power of meditation for all children. This belief lead her to write her first collection of children’s books focused on the practice. Patricia’s books offer an exciting way to introduce meditation to young children in the form of short story rhymes and using a seashell as a tool for focus. 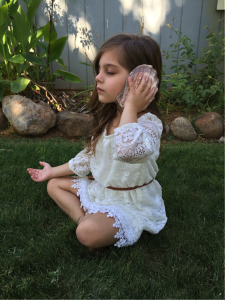 A Seashell Mediation for Children offers a new and exciting way to introduce meditation to young children in the form of short story rhymes, using a seashell as a tool for concentration and focus. While the child holds the shell up to their ear, the story is read aloud to them in a form of meditation.